Three iconic domed movie theaters representative of the futuristic roadside, or Googie, architecture of the late 1950s and 1960s, are set to show their last films on March 31. Last week, the current tenants of the Century 21 Theatre, Guggenheim Entertainment and the Retro Dome theater group, sent out an email alert that programming will cease at Century 21, 22, and 23 as of March 31st, because the lease for the theaters to Syufy Enterprises is up and it not being renewed. The theaters are known locally by their current name, the Winchester Theaters. The property owners, including members of the family of the original architect, Vincent G. Raney, have filed a permit to demolish all three domes, and are fighting any attempt to save the theaters. Many locals fear that the three theaters will be torn down for another shopping center, but no project or plans have yet been filed with the City of San Jose. 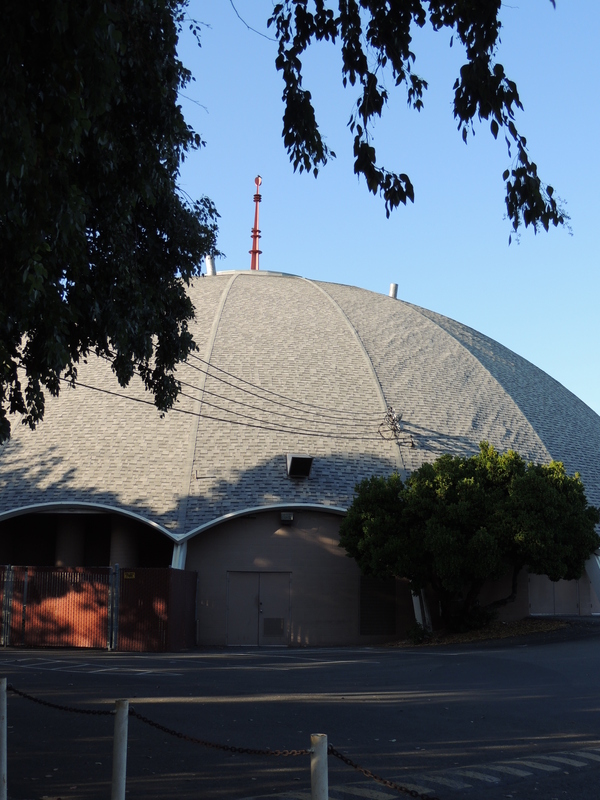 The trio of theaters, near the famous Winchester Mystery House, were originally dubbed the Century Theaters, as commissioned by Ray Syufy, a Bay Area movie theater entrepreneur, who hired Raney to design the domes. The Century 21, which opened in November, 1964, was the first dome in the Century Theaters chain and it was designed to showcase a new widescreen cinema technology called Cinerama. The Cinerama widescreen technology, one of the industry’s many efforts to combat growing competition from television, was originally developed using three synchronized cameras for filming and projecting. But when the first theater designed to show Cinerama opened in Hollywood in 1963, it showcased the improved single-screen Cinerama process using 70 mm film. One year later, Century 21 in San Jose, followed in that vein, showing the same opening film, “It’s a Mad, Mad, Mad, Mad World,” in single-lens 70 mm Cinerama. 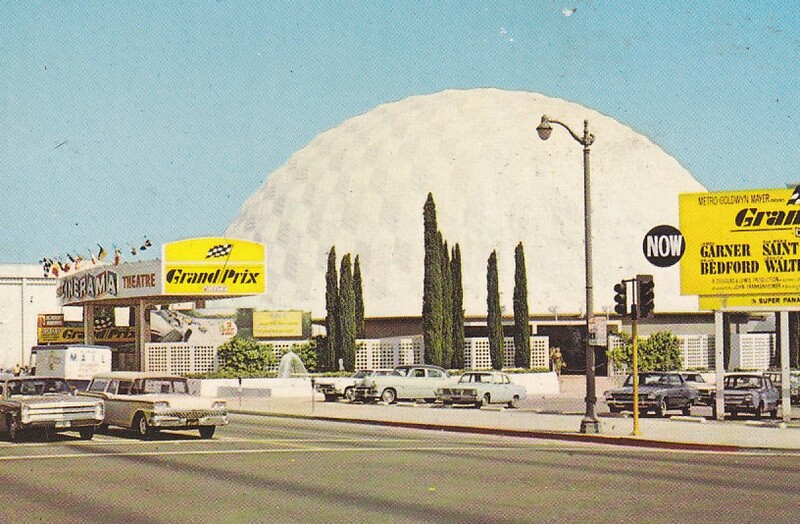 After the first Cinerama theater opened in Hollywood on Sunset Boulevard, other domed theaters ensued. 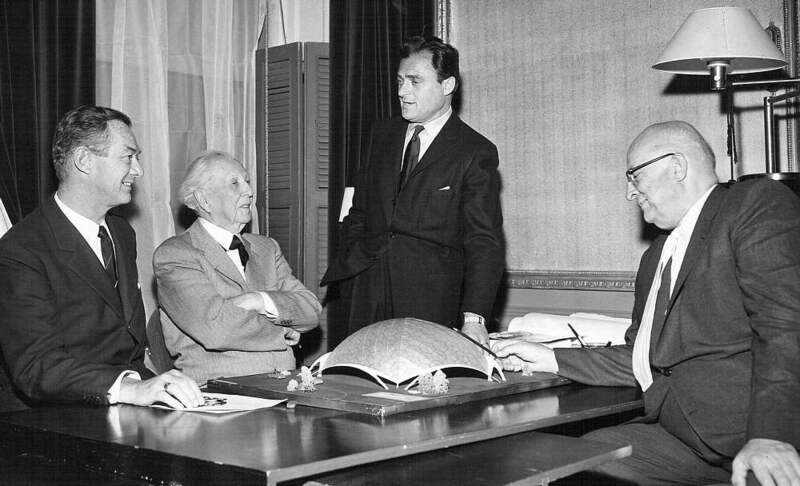 Cinerama Inc., the developer of the technology, promoted the dome design as economical and easy to build. Hollywood’s Cinerama, which has been preserved and is now a city landmark, has a geodesic dome design inspired by architect and engineer R. Buckminster Fuller. Los Angeles has preserved important moments and venues in cinematic history, but in the Bay Area — home of Silicon Valley — these domed theaters, representative of a unique cinema technology, are threatened. Last May, the domed theater in Pleasant Hill, also designed by Raney for Syufy, was demolished to make way for a sporting good store. And in the last few months, two other domed theaters, the Century 24, across Highway 280 from the Winchester domes, and Century 25, in San Jose’s nearby Westgate Shopping Center, were also demolished. Last year, the property owners hired Cassidy Turley real estate and advertised for new tenants to develop the acreage. Preservationists though, including the San Jose non-profit Preservation Action Council, fear the land, targeted by the city as another “urban village” will become another bland Santana Row, the cookie-cutter, faux Tuscan style shopping center and apartments across the street from the theaters. After writing an article in the Wall Street Journal about the plight of the domes and learning about their historic significance, I have since become a supporter of saving at least one theater from the wrecking ball. A campaign to save at least one of the theaters has gathered community support and over 5,500 people have signed a petition in Change.org. But there are also detractors, and in an odd twist, those detractors include the architect’s family. In a letter to the city of San Jose a family member wrote that Raney “believed buildings have a life span and that as a community evolves, so should its architecture.” “He would think the Century 21 is ready for retirement, making way for something new that would serve the City’s and community’s needs now,” wrote Michelle Bevis, on behalf of the Raney and Farriss families, who own the land. Does San Jose really need more bland shopping plazas and malls? Wouldn’t it be feasible to incorporate at least the earliest dome in the chain, a whimsical icon seen from Highway 280, into a mid-century style shopping area or office building? 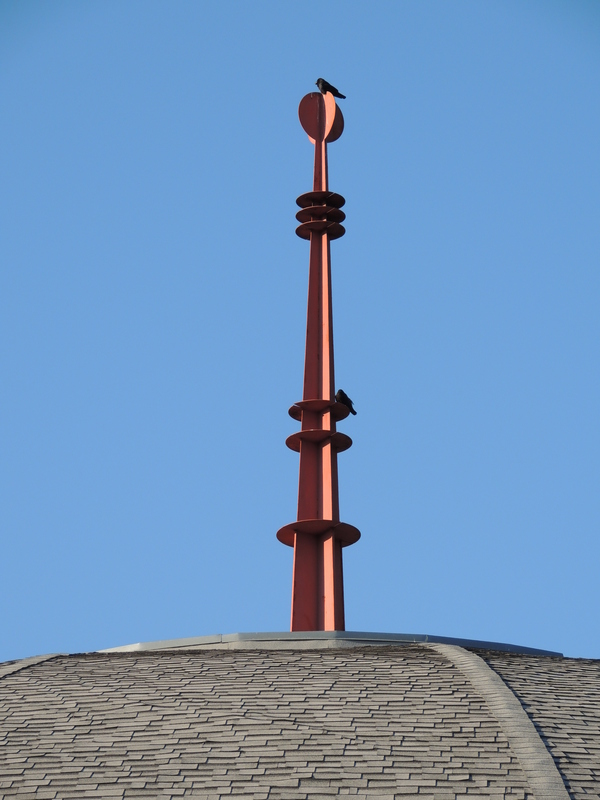 Some have argued that the domes are not historic, nor are they architecturally significant. I beg to differ. The domes, which evoke notions of a spaceship, were emblematic of an era that has vanished, of optimism in the future, looking ahead to the 21st century and the space age with joy and anticipation. The domes were based on the concepts of Fuller, who patented his geodesic dome, a precisely calculated, patterned mesh that provided maximum strength at a minimum of cost. By 1959, Fuller had licensed his dome design to more than 100 corporations and city governments. At two futuristic world’s fairs of the early 1960s, for example, the World’s Fair in Seattle in 1962, and at New York’s World’s Fair of 1964, Fuller-licensed domes or copycats were popular exhibition venues for forward-thinking companies, in that brief interlude of post-World War II optimism. It is also worth pointing out that Apple Inc.’s plans for a new corporate campus, as envisioned by the late co-founder Steve Jobs, also recall the idea of a spaceship. Architect Frank Lloyd Wright was another major influence. Producer Mike Todd, one of the original founders of Cinerama, had formed his own company to work on a competing but improved single lens version of Cinerama, called the Todd-AO process. 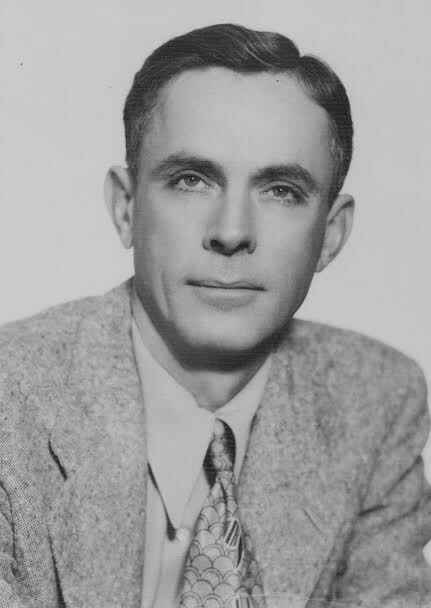 Todd hired Wright to design a domed theater with a geodesic roof using aluminum from Kaiser Aluminum, a theater with gently curved walls to showcase the widescreen movies his company was producing. Wright used Fuller’s concepts, according to the book, “Treasures of Taliesin, Seventy-Seven Unbuilt Designs,” but also modified the size of the dome and the scope of its overhead curve. Wright’s design, according to a rendering in “Treasures of Taliesin,” also included pre-cast concrete shells as walls. But Todd was tragically killed in a plane crash in 1958 and his heirs did not pursue movie theaters. Wright died one year later. Still, the Todd-AO single lens process was used by Cinerama and Panavision as an improvement on the original three camera process. When Raney was hired by Syufy to design the first of many theaters in the chain, Cinerama sent Raney drawings of the standard dome theaters and the scaffolding used to erect it, according to the book, “Suburban America.” In addition, Raney had a personal connection to the site of the first theaters and the nearby Winchester Mystery House: his wife Edna was the oldest daughter of John H. Brown, the man who turned the bizarre tale of Sarah Winchester’s compulsive building additions and expansions to her rambling Victorian mansion into a major tourist attraction. Raney’s heirs today are among the owners of the vast parcel of nearly 12 acres of land the three theaters sit upon, and part of the group of 40 family members who are protesting the landmark nomination. Next month, California’s Historic Preservation Commission will review a nomination submitted by Docomomo Noca, the local chapter of an international non-profit focused on preserving and documenting mid-century modernism. The nomination seeks to add the Century 21 Theatre to the state’s register of historic resources. The nomination will be reviewed by the State Historical Resources Commission on April 22, at the California Preservation Foundation Conference at Asilomar. (disclosure: I am now on Docomomo Noca’s board). But it seems like in San Jose, it’s out with the old, in with the new. Let’s hope some compromise can be achieved and that an important piece of the Jetsons era in Silicon Valley can be saved.